This has Now Officially Become an Obsession! More Revive Ad Server Testing. I have not yet begun to test! After having tried several versions of the Revive Ad Server software on the Chuwi HiBook Tablet the last week or so, I reached the conclusion that it was not going to work. However, because I hate to have a mystery on my hands, I went ahead and installed the latest Release Candidate onto the Asus Notebook version of THE Tablet Test Server here and it has been up and running for almost 24 hours with not a single glitch. No errors in Apache at all, none, zero, zilch. Configuration wise these 2 platforms are running the identical virtual machine. The only differences being that the notebook is a mere dual core Intel Celeron running at 1.6 GHz and the tablet has a Quad Core Z8300 Intel at 1.44GHz, which should be, in theory, a more powerful CPU. The allocated ram on the Asus Notebook was bumped to 1.9 gb versus the tablet running at 1.7 gb, but memory was never the issue at all. So while this is not technically “tablet” related, it is related because we are finding out if it is a hardware issue or a software issue. That and I just hate to surrender too easily. 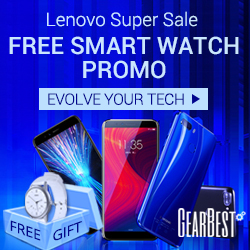 Any advert prepended with “Shop Gearbest” is being served via the Revive software. HiBook Tablet and Revive Ad Server, Day 2 of Testing. Previous PostToday’s Video Worth Sharing: Gooseneck Mount Work Around – If It Was a Snake It Would Have Bit Me!Next PostTonight’s Video Worth Posting: Friday Night Vlog, Gooseneck Mount, Budget Smartphone Overload, OnePlus 6t Rumors?